One of the reasons that I’m very sympathetic to anyone who says they don’t “get” time signature, is that my own hearing and sense of metre can play strange tricks on me. The most bizarre of these is when I accidentally play the “wrong” thing for an exercise, and it turns out to be OK, because there’s some kind of metrical equivalence that I had never thought of before (there’s a diagram coming to explain that). Here’s an example: the other day, I did something in class that I don’t think I’ve ever done in 28 years of playing for ballet. The teacher marked a ronds de jambe à terre exercise, a bog standard 3/4 one, no surprises, no tricks. But as I was watching, the music that started playing in my head was What a wonderful world. It’s against all the unwritten rules of ballet (ronds de jambe must be on a dirgy 3, or – once, in about 1976, on a slow 4) that I hardly dared do it. But it went almost unnoticed, which is to say, nobody died, and everyone did the exercise, and the teacher didn’t stamp the floor and look shocked. So it does work. If you think about it (which I did, for a few seconds before, to see whether it could possibly work in theory, and a long time afterwards, to explain why it did in practice) one bar of a 4/4 ballad-y thing like that, with triplets in the left hand, is at some level equivalent to a bar of 2 bars of 3/4. One reason why it’s not immediately obvious is because those six quavers are split down the middle in the 4/4, and into 3 lots of 2 in the 3/4. Another reason is that when you think “6/8”, “3/4” or “4/4”, you think certain kinds of music or tune, you don’t think about imaginary metrical levels that might connect them in a metric-theoretical universe. The diagram above shows – metrically – how a 4/4 ballad with triplets, a tune in 3/4, and a tune in 6/8 could be used for the same exercise. Imagine the 6/4 written out in 6/8 with semiquavers instead of quavers, and played half speed. I’m not offering this as a handy tip for solving problems in class – like I said, it’s taken me almost my entire career to work this out, and it makes my brain hurt to look at that diagram. I discovered the trick only this year, when playing for adages – when teachers mark something in what sounds like an impossibly slow 3/4, you can play a 4/4 ballad. I couldn’t work out the theory, I just found it worked. One of the things that enabled me to work it out, was (mis)hearing a teacher counting a bar of 6/8 in a rehearsal – I couldn’t tell whether she was grouping the notes in threes or 2s, so it sounded sometimes like 3/4, sometimes like 6/8. This connects eventually with my last post on the perils of being too “musical” as a pianist – ballet teachers are sometimes much “cleaner” and stricter in tempo than us musicians, and that’s why I was able to mis-hear what she was singing. The trouble (for pianists) with thinking in 3/4 (as in Santa Lucia in the diagram), is that under the influence of the tune or the main metre, the quaver accompaniment begins to slide into fancy “musical” performance. If, on the other hand, you mentally imagine that you’re grouping the quavers as 3+3 instead of 2+2+2 (as in the bottom line of the diagram) you slip out of the 3/4 tendency, and it becomes the steadier, more reliable undercurrent that is better in adage. All of this makes me think that Justin London’s “Many Meters Hypothesis” is absolutely bang-on. Metre isn’t a neutral grid that you can just lay over or extract from music, so that all 3/4s are in some way equivalent. Quite the opposite – within the range of things that are in 3, for example, there are repertoires which have particular qualities of threeness, and you’ll recognise and parse these to a greater or lesser extent, depending on your musical enculturation. The proof of this, to me, is that the theoretical (metrical) equivalence of the three things that I’ve shown in the diagram is so strained as to still appear unusual and unintuitive, even when you see it written down and “proved” on paper. Each of those pieces has a particular feel which cannot be reduced to a unifying metrical level. A timely caution: one good subdivision does not necessarily deserve another. Given the fact that most music is made between beats, it follows that the fewer the beats, the more music making can take place. That to me sums up the hazards of marking adages for the pianist. Teachers are encouraged to indicate musical subdivision to musicians, and sometimes, it’s good that they do. But in adage, the more they prescribe the subdivision, the less chance there is that you as the pianist can think laterally about how to fill the space between the beats. And for the teacher, those subdivisions are less significant, it seems to me, than they are for the pianist – but you have to be a brave soul to take the risk and play something other than was marked, in case the teacher really did want that thing she asked for. Nine times out of ten, I don’t think it matters. I’ll run and hide now. This entry was posted in Personal and tagged Justin London, Music, Personal, ballet, ballet class, conducting, metre, piano, prausnitz, subdivision, time signature on October 21, 2014 6:48 am by Jonathan Still. Meter vs subdivision: An easy solution to the ballet and time signature problem? In the course of writing an article about the problems of ballet and time signature recently, I read a lot of books and articles about 18th century theories of meter. I’ve already blogged about that several times recently, as I found a lot of it helped to answer queries I’ve had for years. As the dust has settled on the thoughts that I had for the article, I have come to a conclusion, for now at least, that “mixed meter” as the 18th century theorist Koch used that term, offers a really useful way of understanding meter and time signature problems in ballet teaching. I began to formulate that idea in And now for something completely sextuple, but I could say it even more simply now. The problems I’m talking about are almost exclusively to do with triple meter, and the fact that in the kind of music that you get in ballet classes (i.e. predominantly 8-count or 8-bar phrases) there is always a possibility of counting in 2 or 4 rather than 3 – and if trainee ballet teachers have to learn about time signature, they often have difficulty understanding why something should be classified as a 3 or a 6 when it seems more natural to count it in 4. If Koch were to come back to earth and teach such courses, he probably wouldn’t say “you’re wrong, it’s a 6,” he would have said “this is a tripled 2,” or “mixed meter” – you’re right, it is four, because the tune is moving predominantly in a 1,2, 1,2, fashion, rather than diddeley diddeley diddely diddely style, like a double jig, or Schumann’s Der wilde Reiter/The Wild Horseman. Koch’s point was that these things that sound like fours, are fours, but you write them in compound time like 6/8 because it’s notationally easier. A true 6/8, or truly triple meter, is one where the movement of the tune coincides with the “6” in the top of the time signature. The exceptions – and they have to be learned – are the triple jig, the polonaise, and the sarabande, and very slow versions of either minuet or mazurka (and of course, many other styles of music that are not so commonly used in ballet). It’s rather a shame that I’ve only just realised this at the point in my life where I no longer have to teach it, but that’s why partly why I keep a blog – to atone for my past conceptual sins. This entry was posted in Personal and tagged 18th century theory, Koch, Music, Personal, ballet class, ballet teaching, meter, time signature on September 17, 2014 7:54 am by Jonathan Still. This variation by Mozart on “Ah, vous dirai-je maman”, K.265/300e has turned out to be a real life-saver in class for one of those ballet exercises where you need a 6/8 that gives you six quavers in a bar (click here to hear it). If you’re thinking “But that’s not a 6/8,” hold on, I’m coming to that, in this discussion of compound meter. The Mozart is useful for class, but it’s also an example of a particular kind of 6/8 that does what you’d think it would do, i.e. articulate six quavers that you can hear and count. Not that you’d want to count them, but they’re there, so you can hear why it’s called a six. Many pieces in 6/8 don’t go like that (they just jig along rumpty-tumpty fashion, so they sound barely distinguishable from a 2, so to see why it’s a six, you have to imagine the beats that you can’t hear. What is compound about compound meter? It’s things like this that make me dread trying to explain compound meters such as 6/8, coupled with the fact that the term “compound meter” (or “compound time signature”) does not convey anything useful or hearable in the “compound” part. The meaning that “compound” once had in this context is rarely taught in music theory – that a 6/8 was at one time a way of writing two bars of 3/8 as compound bar, thus halving the number of barlines you had to draw. Well, that’s part of the the story, at least. In Danuta Mirka’s Metric Manipulations in Haydn and Mozart, she explains that the eighteenth century theorist Koch viewed 6/8 sometimes as a “compound metre” in this sense, and sometimes as a “mixed meter” or a simple meter of “tripled beats”. 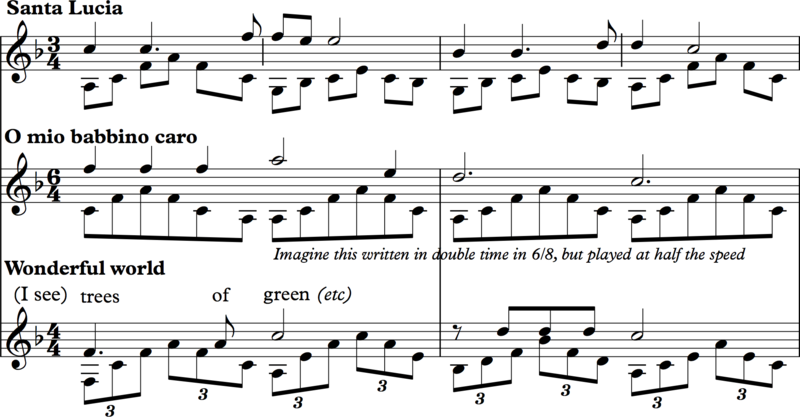 That is, some 6/8s are basically just 2/4s with triplets (and some 9/8s are just 3/4s with triplets), but for notational ease, you might sometimes write the “tripled” 2/4 as 6/8. The difference is crucial – one is triple subdivision (tripled 2/4), the other (compound 6/8) is triple meter, even if they’re both notated as 6/8. Which brings us back to a well-worn topic on this site, truly triple meter. It’s truly triple rather than sextuple, because to Koch, it’s a compound of two 3/8 bars (with equal weight in both halves of the bar, and quavers establishing the meter. That in turn is one reason perhaps why Mozart didn’t write this as 6/8. It’s clearly duple, rocking between stronger and weak beats in each bar. Is compound meter really just about subdividing beats into three? This is why it’s so hard to teach about compound time signature as a concept to those (like dance teachers) who are trying to understand how it relates to hearing music. To recap a previous post: If you look at many music primers, they’ll tell you that compound time signatures are where the beats are divided into three, and simple are where they are divided into two. Nothing about the term “compound” suggests “divided into three”, and if you’re looking at a time signature like 6/8, unlike the simple meters, there is no visible beat to be divided, it’s already been divided as part of the time signature. It makes no sense, unless you explain what I’ve explained above, which also explains what is simple about simple meters – not that the beat is divided into two, but that the bars are single units, not joined together as in compound signatures. But also, “compound time signature” only describes one concept of 6/8, and one which does not continue into the 19th century and beyond, where we describe it as if it were a duple metre with triple subdivision. That is the why the Mozart piece is relatively unusual, and so useful. It is duple with triple subdivision, but it tips over into the realm of a truly triple meter because the movement that one hears, clearly on the musical surface, is of a continuous triple meter. It is hard to retain tripleness in the metrical slipstream of a piece which is duple at another level, but Mozart does it. Tears for Fears’ song “Everybody wants to rule the world” does it some of the time – there’s a constant, steady, truly triple 6/8 going on in a lot of the music, but the vocal line exerts a strong duple pull. Mozart’s advantage is that the tripleness is centre-stage in the melody, it’s not a support act. In “Everybody wants to rule the world”, it’s not exactly melody and accompaniment, they are simultaneous, equally salient layers of the music which both draw your attention (incidentally, the song’s time signature as published is notated in 12/8 with (4/4) in brackets). Disambiguating 6/8s into those which are characterised by triplet subdivision, and those which are truly triple meter seems to me to solve the problem, because it’s how people in the real world hear this music. You could argue that you should teach basic time signature before these more complex topics, but to my mind, teaching “compound time signature” by saying it “means” dividing a beat into 3, is oversimplifying the case to the point where it becomes difficult to understand because it doesn’t make sense. Koch’s theory isn’t simple, but it makes sense, and it reflects clearly the fact that 6/8 is not a single concept, but, echoing Justin London’s “many meters hypothesis”, it is a structure that has multiple expressions in real music. A differentiation between two types of 6/8 is partially clarified in Labanotation and Benesh Notation, because you have to say what level of the beat you’re using as your pulse. However, the issue here is not about the pulse that you count or sense as being the main beat, but level of beat where the musical action happens. Music could be truly sextuple (i.e. triple x 2) compositionally, but whereas a dancer might not count it that way if it’s fast, the composer on the other still writes it that way, because that’s how the music moves. It would be good if in ballet teaching we had words to describe different kinds of 6/8, at least at the point at which you learn about time signatures, so that you can account for the fact that some don’t sound like six at all, and some do. We need something like a “triplety-two” and “truly sextuple” and a “swingy two” for those things like 6/8 marches that barely reveal any of their sixy undergarments, and possibly a few more. Dance rhythms are handy – but only if both parties (teacher and musician) have the same shared vocabulary and understanding, and only up to a point. It would be nice to be able to have something that was like a 6/8 march metrically, but wasn’t a 6/8 march culturally (or is that impossible?). Any ideas for some new terms? This entry was posted in Music, Personal and tagged 18th century theory, 6/8, Danuta Mirka, Personal, compound meter, meter, metre, music pedagogy, music theory, rhythm, time signature on June 28, 2014 1:59 pm by Jonathan Still. Someone asked me last night what made me want to do a PhD in music in ballet training. I explained that one of the reasons came out of trying to teach time signature to trainee ballet teachers. It’s not that I think they ought to know about time signature, but I was filling in for someone who thought that they did. Trying to teach time signature did my head in, literally (you could say) to the extent that nothing but a PhD would really sort out the mess. In the first class, I realised that the students knew more than I did about music theory, because they were studying for their ABRSM Grade 3 theory. In decades since I did that exam, I’d forgotten about terms like ‘melodic and harmonic minor’ (someone later asked me what ‘harmonic minor scales’ were for, and to this day, I don’t know). I’d also forgotten about simple and compound time signatures. As a musician, you look at a piece, see that it’s in 6/8, and play. There is no need to categorise it as ‘simple’ or ‘compound’. I bluffed my way through the first class, and then went away to quickly mug up on all the theory I’d forgotten. I was confused. What is a compound time signature? Why is it called ‘compound’? What is simple about a simple time signature? Why does dividing a beat into three, rather than two, make it ‘compound’ rather than ‘simple’ (as most theory books tell you)? That leaves 3/8 in a rather odd position, because according to half of the theory, it should be compound, and to the other half, it should be simple. People argue about this on the internet, and one theorist says ‘Better to just remember that 3/8 is simple triple, for the exam’. If (as other theorists tell you) compound time signatures are called compound, because they’re a compound of two or more bars of 3/8, then why logically, isn’t 4/4 also a compound time signature? It didn’t make sense to me, so how would I explain it to someone else? Then in 2002, I bought the newly published Cambridge History of Music Theory, and read Caplin (2002, p.661), where I discovered that some theorists in the 18th century did claim that 4/4 was a compound time signature, for exactly the reason that I thought they should. The main thing is, they argued and disagreed about what ‘compound metre’ meant, and which metres were compound. In the years I’ve spent dealing with scores and music notation, and working with dancers, metre and time signature has never gone away as a problem or an interest, because contrary to appearances, it’s culture, not arithmetic. My latest joyful discovery is two articles on metre in Communication in Eighteenth Century Music, one by Danuta Mirka, the other by William Rothstein. Mirka’s article is about the way that composers in the eighteenth century would manipulate the metre of music without changing the time signature (she differentiates between the ‘notated’ metre and the ‘composed’ metre – ‘notated’ is what’s on the page, ‘composed’ is what you hear, after the composer has played around with your sense of metrical accent). Here’s the bit that I like a lot: Koch and Marpurg (18th century theorists) say that if you’re listening to something that has been notated in compound metre (remember, that’s either 6/8 or 4/4), you can tell whether it’s ‘simple 4/4 or compound 4/4’ or ‘simple 6/8 or compound 6/8’ depending on whether caesuras (roughly speaking, the end of a short musical statement) come in the music. If the caesura comes in the middle of the bar, then it’s compound, if it comes at the beginning, it’s simple. Mirka’s article has several examples from Haydn that demonstrate this principle. One of them is the Adagio from Haydn’s string quartet in B flat major, Op. 50 No. 1 (arrangement for piano/cello from IMSLP here) where the first four bars are (in Koch/Marpurg’s terms) in simple 6/8 (because you only have one downbeat), and the last two are in compound 6/8 (because you’ve got two downbeats, and it’s effectively two bars of 3/8, notated as 6/8). The fascinating part here is that this can be construed as ‘balancing’ (in an aesthetic/theoretical sense) what appears to be an unbalanced (6 bar) phrase, because the first section is four bars of 6/8, the second is (effectively) four bars of 3/8. Whether you completely buy into that is a matter of theoretical position and interpretation – and Rothstein takes issue in his article in the same book (p. 114) with an analysis along the same lines by Maurer Zenck of a mid-bar cadence in Beethoven. Whatever position you take, the idea that there can be times when 6/8 or 4/4 are simple, and times when they’re compound, makes more sense than categorising 6/8 as “compound”, and 4/4 as “simple”. I’ll try to summarise as briefly as possible, with inevitable loss of detail and accuracy – better to read the article yourself, don’t take my word for it: In compound metres, he distinguishes between French, Italian and ‘neutral’ barring. French compound metre is where you get half-bar anacruses, and cadences on a downbeat, and it’s rare in the late 18th century onwards. Bach’s Badinerie from the Suite in B minor is written in 2/4, with a half bar anacrusis, but he could have written it as a French compound 4/4, i.e. so that you have a 3-beat anacrusis – because that’s effectively what the music does. German compound metre is where you get a short or no anacrusis, and cadences are on the second beat of the bar. ‘Italian‘ is where you might just as well have written it in 3/8 or 2/4 (what Mirka calls compound 6/8 or compound 4/4, in reference to Marpurg & Koch). This has finally solved a mystery for me that bugged me all the time I was preparing the scores for the RAD’s new Grades 4-5 syllabus. There were two pieces, one by Verdi (E03b, Canzone Greca from the ballet music from Otello), and one by Bizet (E5a, prelude to l’Arlèsienne) where the melody begins on the half bar, where I nearly rebarred the music so that the downbeats fell on ‘one’, because it sounds like ‘one’. But then I realised that this made the cadence land in the middle of the bar, and that looked wrong. So I ended up having to just write a big ‘1’ underneath the half bar in the music, so that there wouldn’t be any arguments in the studio. I can’t say for sure what the answer is, but in the case of l’Arlèsienne, it seems to me that this is a clear case of French compound metre – the point is to get that final cadence on a downbeat (just as many French words are end-accented), and not make such a big deal about the metrical accents in between: it’s long jump, rather than hurdles. Otello, I’m inclined to think is somewhere between French and Italian compound, in Rothstein’s terms, because you could rewrite the beginning in 2/4, but when the long legato melody that comes in in the middle, it begins with almost an entire bar anacrusis, and it cadences on the downbeat. If you rewrote this in 2/4, you’d lose those long lines. It’s precisely the ambiguity of this music that I suspect makes it so effective for fondus, because you never got a strong sense of either up or down, it’s in a constant state of fluid tension. If you’re a music theorist (like Mirka, Rothstein or Caplin) and you’re reading this thinking “Why on earth is someone who doesn’t understand all this, trying to teach music to ballet teachers?” then you’ve got a good point. Hands up, people like me shouldn’t be trying to teach time signature when they don’t understand it themselves, but they do. Or maybe we shouldn’t be trying to teach about time signature at all, if in fact it’s so darn complicated that you need a PhD to understand it properly. Or maybe we should just stick to basic ‘facts’, and not get into this kind of detail. But you can’t do that with dancers, because they’ll ask the kind of awkward questions that lead you straight back into complex theory of metre. And that, roughly speaking, is one of the things that got me into this PhD. Caplin, W.E. 2002 Theories of musical rhythm in the eighteenth and nineteenth centuries, In T. Christensen (ed.) Cambridge History of Music Theory. Cambridge: Cambridge University Press, 657–694. This entry was posted in Personal and tagged Personal, compound metre, metre, music research, music theory, musicology, time signature on March 28, 2014 11:47 am by Jonathan Still. For many people, especially dance teachers, ‘hornpipe’ is synonomous with 2/4 time. But there is another hornpipe in 3/2, particularly common in English baroque music, an example being Purcell’s Hole in the Wall (see below). Another example is the Scottish tune ‘Dance to your Daddy‘, the rondeau from Purcell’s Abdelazer that’s used in Britten’s Young Person’s Guide to the Orchestra or the hornpipe from Handel’s Water Music. What those last three tunes have in common is that until about a year ago, I had never realised they were in three – I hadn’t ever considered what their metre was, because in fact, metre in the sense of regular grouping accents doesn’t seem to emerge from those tunes – they just seemed to me to flow as melodies without sensing that they’re in 3 or 2 – or anything in fact. I sometimes wonder why I would teach people to try and perceive patterns in music that I don’t perceive myself, even with my musical training. I’m afraid I have no answer to that yet. A wonderful collection of links to hornpipes in 2 and 3 from a site about English & French folk music. This entry was posted in Advent calendar, Dance, Music and tagged advent 2009, metre, rhythm, time signature on December 9, 2009 5:55 pm by Jonathan Still.